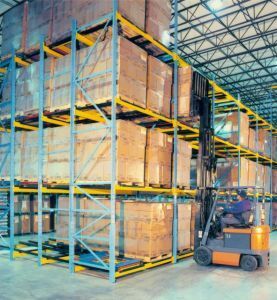 Push-Back Pallet Racks uses telescoping carriages to store pallets up to five deep, providing multiple pick facing with extremely high throughput. Pallets are fed and retrieved from one aisle, reducing picking times and making these Pallet Rackss ideal for applications that require a large number of picking faces. Provides optimal combination of selectivity and storage density. Debris-free design makes these Pallet Rackss perfect for food applications. Before you commit to expensive lease space, give us a call. Many of our Utah Push Back Pallet Racks shelving systems will pay for themselves, just in lease savings alone! Here at NationWide Shelving, we have the most competitive prices on the market today. We also guarantee our products to be among the best of the best for high quality. We represent the major players in Push Back Pallet Racks including Frazier, Interlake Pallet Rack and MANY more. We are leaders in steel storage products, and that allows us to deliver a product with quality second to no other. Since Nationwide Shelving is a top shelving provider, we are able to keep our prices low, virtually beating any price for our products on the market today.